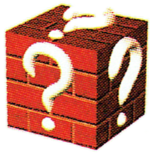 An Event Block is an item that appears in Mario Party. It is bought at the Mushroom Shop for 200 Coins, and upon buying it, it can be turned on and off at the bank. It is hidden in one of the spaces on the board, and when a player lands on that space, the Event Block appears. The player would then get one of three events: Boo, Koopa Troopa, or Bowser. Boo steals Coins or a Star like normal, Koopa gives the player 20 Coins, and Bowser takes away 20 Coins. This page was last edited on March 10, 2018, at 01:04.